Part of what makes Eclectic Designs that little bit special is our ability to build subtle touches into our clients' designs. 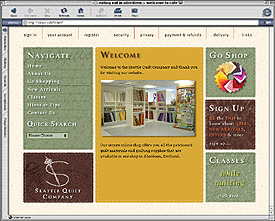 In this case, our client required an e-commerce site selling quilting materials. Apart from background patterns suggesting the products on offer, the main pictures look like they have been cut by pinking shears. This attention to detail is carried through to the stitching found on the navigation panels.